Traditionally, telecommunications denoted the long-distance connections that linked television networks to their affiliates and the long-distance phone connections that linked telephone networks to local switching centers. Hence the term applied both to AT&T's long-distance telephone network and to the television industry's worldwide networks-but each used very different technologies to transmit voice or video. Now with the rapidly growing size of the Internet, telecommunications has expanded to include data networks. The newest technologies to join the telecommunications industry are wireless phones and wireless data businesses. Telecommunications and information-related industries continue to enjoy a rapid growth in the Internet and the wireless phone sectors. Table 1 provides a summary of the major classes of telecommunications services and how they function. The concept of universal service has traditionally referred to the goal that all Americans should have access to affordable telephone service. Television access does not require that homes be wired, so that is less problematic; but there is increasing pressure for universal Internet access. Universal telephone access has been met by means of policies established by government regulatory bodies. Phone or Internet services in densely populated areas promise good revenue and profits, because the cost of wiring businesses and residences is lessened by the short distances. The regulations are needed to ensure that people in remote areas have access; as people continue to move further and further away from population centers, the cost of bringing phone wires can be prohibitively expensive. But the phone companies are nonetheless required to extend the wire to them. The quid pro quo for making the huge investment to wire homes and businesses was protection from competitors; this protection was usually provided by state public utility commissions or municipal government policies. As a practical matter, limiting competition and the number of wires strung along highways and into homes makes good sense, especially from an aesthetic perspective. In 1996 the Federal Communication Commission (FCC) issued an extensive new set of regulations to increase the competition in the industry. The local phone companies take serious objection to competitors coming into their territories and grabbing business and residential customers in the densely populated urban and suburban locations. But that is what is happening; cable-TV companies are partnering with long-distance companies and using their cables to offer a package of phone, TV, premium TV, digital music, Internet access, and e-mail. The Regional Bell Operating companies have also engaged in a variety of mergers. The FCC appears to be ready to approve mergers that open up competition in the local phone and cable-TV markets (e.g., AT&T was allowed to acquire TCI and other cable services), but not always the mergers between local phone companies. The National Telecommunications and Information Administration (NTIA), an agency of the United States Department of Commerce, is the executive branch's principal voice on domestic and international telecommunications and information technology issues. NTIA works to spur innovation, encourage competition, help create jobs, and provide consumers with more choices and better quality telecommunications products and services at lower prices. Now that a considerable portion of today's business, communication, and research takes place on the Internet, access to the computers and networks may be as important as access to traditional telephone services. The NTIA is preparing policy to ensure access to the Internet service. In 1982 AT&T signed a consent decree agreeing to the break up of its business into the long-distance business, which it retained, and seven Regional Bell Operating Companies (RBOCs), which became separate business entities serving specified regions. The Telecommunications Act of 1996 was a major revision of policy regulating the industry. That act attempted "to promote competition and reduce regulation in order to secure lower prices and higher quality services for American telecommunications consumers and encourage rapid deployment of new telecommunications technologies." The act tried to stimulate competition by laying down the conditions for regional phone companies to move into the long-distance arena and for long-distance carriers to offer business and residential phone services. But little in the way of increased competition has occurred in the mainstream telephone industry, even less in the cable-TV industry. Cable-TV companies are in the best position to become profitable, because their cable systems can provide the full package of services into the home. Providing long-distance phone service and Internet service requires a partnership with a long-distance carrier. As a result, mergers in the business have become hot topics. The cable-TV sector is the least competitive telecommunication market, and cable companies have been able to increase their rates. But many companies carry a large debt load resulting from the costs of upgrading their cable systems; repayment of their debt is the justification for rate increases. The regional phone carriers are poorly situated for long-term competition. Currently, most are protecting their profit margins and fending off competition. But direct competition from the cable-TV and AT&T companies in the local phone business could be catastrophic for them; AT&T is promising substantially lower monthly phone rates. The phone companies are impeded by their slow-speed wires and switches from providing high-speed Internet access-video over their system is impossible. They are being forced to consider the huge investment required by rewiring every home in order to stay competitive. The wireless phone business is largely unregulated, highly competitive, and growing very rapidly. Having a national network, whereby long distance calls remain on a single carrier's infrastructure, has become a strong competitive edge. The result is that customers' phones work in every major city and that there are no roaming changes to cover long-distance changes from other inter-exchange carriers. Bigger is better in this environment, and large wireless companies are thus merging with long-distance carriers. Internet access and e-mail are the fastest growing services in the telecommunications industry. The Internet-service business is made up of the linkages from homes and businesses to Internet service providers (ISPs), which in turn provide linkages to the major Internet backbone mostly provided by long-distance carrier MCI Worldcom. In 1999 most of the linkages from homes and businesses were carried by the local phone companies; while much faster speeds were available from the cable-TV firms, few were ready to provide data services. Competition for high-speed linkages from home or business to the Internet backbone will be intense. The cable-TV industry is much better positioned to capture business in the short term; eventually, digital lines into businesses and homes will probably be needed as voice, TV, data, and on-demand video are all delivered in a digital format as part of a package of services. A long-distance telephone call is the typical way in which most people experience the telephone network, which extends from home phones to a local switching center, then to another remote switching center, and finally to the home or business called. The term telecommunications primarily applies to the long-distance carriers, such as AT&T, MCI, and Sprint, which carry transmissions between switching centers. The local telephone markets are dominated by the Regional Bell Operating Companies (RBOCs), such as Verizon, BellSouth, and SBC Communications. The RBOCs bear the responsibility for universal access, for ensuring that every residence-no matter how remote-has affordable phone service. Often these rural and remote sites pay the minimum amount, approximately $15 per month, for the minimal service. The RBOCs claim that their costs for customers exceed $15 per month; the public utility commissions at the state level help the RBOCs subsidize those customers with revenue from urban and suburban customers, as well as access fees paid by long-distance carriers. The RBOCs are guaranteed a profit by the public utility commissions, but the rates have been virtually constant with little growth in the number of phones added. At present, this is a good business to be in, but it is expected to be a very bad business as competition from cable-TV companies drives down prices. Each local telephone center is a hub from which copper wires extend to homes and businesses. This last mile of wiring is the window or portal into millions of homes and businesses, controlling-in some ways-the services provided and the revenues generated from homes and businesses. The last mile of wiring is also the major bottleneck to providing better and faster services to those millions of sites. The twisted pair wires in virtually every home are the major problem with boosting the speed of Internet access over those lines. But those millions of miles of wires are extremely expensive to replace. In order for the regional phone companies to effectively compete agains the cable-TV companies, they will have to rewire, thereby opening up the possibility of providing the full bundle of services to the home owners. In every major Asian city, wireless phones are everywhere. This phenomenon will be repeated in the United States as more and more workers transact business away from their desks, and as less and less time is spent at home. It is quite possible that phone calls originating from wireless phones will surpass those from wired phones in the near future. John Malone, a cable industry executive, coined the term convergence to describe the packaging of multiple services to customers, such as cable-TV, premium movie channels, Internet services, digital music channels, and phone service. Convergence is made possible by advances in transmission technology; all of those services can be provided to homes over a single cable. And that means that cable-TV companies can move into the phone business, phone companies can move into the TV business, etc. As convergence becomes a reality, competition in the telecommunications industry moves to new level. All the major cable-TV companies have announced that they will provide high-speed Internet services alongside the regular TV and pay-per-view channels; TCI and Time Warner say they will also include telephone services. 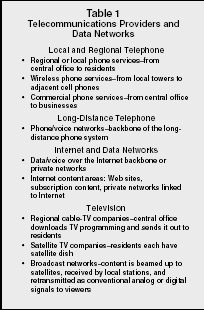 All these services will be offered over one coaxial cable (wire). The cable companies employ a transmission approach called broadband; Media One's logo includes the phrase "Broadband is the Future." Coaxial cable can carry high-speed data and/or multiple channels of video over an insulated central copper wire wrapped in another cylindrical conducting wire, which is then shielded and wrapped in a protective cover. This wire is split into many channels by breaking out the wiring spectrum into multiple frequencies and transmitting each channel on a separate frequency; this is what broadband means, it delivers an amazing amount of content by using frequency division multiplexing. Part of the available frequency spectrum is dedicated to data for Internet access and another part is dedicated to voice for telephony. As great as broadband sounds, it has the inherent drawback of being an analog approach for sending digital TV signals, digital sound, and for sending and receiving digital data; at both ends of the cable, a digital-to-analog or analog-to-digital conversion is required. Another potential problem is that the data channel might become overloaded as more and more customers begin to interact with Internet services; broadband was designed as a transmission approach to send multiple channels of video one way only, while e-mail service is two way. The unshielded, twisted pair of wires in virtually every home are the major impediment to boosting the speed of Internet access over phone lines. Speed for sending and receiving data is expressed in terms of how many bits (ones or zeros) per second can be moved. The maximum speed for a telephone modem is 56,000 bits per second; most people find that annoyingly slow. The phone companies are implementing a new service called digital subscriber line (DSL), which uses its four wires to carry both voice and data simultaneously in both directions. Data can be received or downloaded from the Internet at speeds up to 1.5 million bits per second, but data sent from the home moves at a much slower rate. DSL technology, however, is proving difficult and expensive to implement, especially at distances greater than two miles from the switching centers. The requisite DSL modems are also more expensive and difficult for users to install. DSL gives the phone companies voice and high-speed data services, it does not open up the lucrative premium TV market. In order for the regional phone companies to effectively compete against the cable-TV companies, they will have to re-wire, either with coaxial cables or fiber-optic cables. But that will make them competitive with the cable companies and open up the possibility of providing the full bundle of services to home owners. Fiber-optic wiring is the preferred choice of the long distance companies and often the preferred choice of regional telephone companies as they upgrade in urban and suburban locations where demand for capacity is a concern. Fiber-optic media is much faster than electrical wires, it is unaffected by electrical interference, and much more secure. But it is much more expensive to install because these tiny glass filaments are very difficult to align and join together. Lasers transmit pulses of light, rather than electrical signals, to send data and photo-decoders to receive the data; hence the speed of the lasers is dependent on these devices. The hair-thin strands of fiber are made of very pure flexible glass or plastic filaments along which photons, the fundamental unit of light, move in waves or streams. The speed and capacity of fiber-optic cables keeps on doubling and will continue to expand exponentially. In 1995 scientists introduced wavelength division multiplexing (WDM), a method of splitting (multiplexing) the cable into streams of color, each carrying 2.5 billion laser pulses per second. Initially each fiber carried eight streams of data at 2.5 gigabit speeds, the multiplexed total capacity being twenty gigabits per second. In 1997 new WDM devices doubled throughput with 16 color bands, and soon after it became possible to multiplex into 40 colors; in 1998 80-band systems were announced as were 160-band systems for the year 2000. At the same time, the lasers sending and receiving the data streams increased in speed from 2.5 gigabits to 10 gigabits. 400 gigabits-per-second speeds per fiber strand are commercially available, as well as, terabit speeds provide quite a contrast to the 56,000 bits per second modem speed. So much additional capacity has become available that prices dropped by a substantial amount. Inexpensive high-speed communication links mean that distance is dead; instantaneous global transactions can become a reality. There is rapid growth (approximately 80 percent per year) in the wireless phone business. Prices continue to decline for both the phone devices and the monthly service charges. Sprint, AT&T, and Verizon (to name a few companies) are advertising hundreds of minutes of calls anytime and to anywhere in the United States for $49 per month; this is an example of a price incentive made possible because of these companies national networks. It would not be surprising to see mergers between other long-distance companies, following the lead of MCI WorldCom. Wireless phones and wireless data services send and receive voice and data from their antennae to local towers, which are, in turn, linked to adjacent towers and long-distance lines. The area within range of any tower is called a cell; most are adjacent to other cells, forming a honeycomb pattern. As mobile wireless phones move from cell to cell, their calls are automatically switched from tower to tower. There are many dead spots-especially in rural areas-with no reception because there are no towers nearby. The first cell phones were analog devices, with well-known security problems and often poor-quality reception. Cellular phones broadcast in the 800-900 MHz frequencies; which some scanners can hear. The newer digital phones provide better security and better quality sound, but they operate at lower voltages, have shorter ranges, and require more towers. The PCS standard for digital phones has been widely accepted in the United States, but Europeans have adopted another digital standard, GSM, making wireless communications during international travel difficult. There is already a great deal of push to commercially provide wearable PCs, combinations of PDAs (personal digital assistants) and phones that handle both voice and data. A small single device would offer voice mail and e-mail, pager and beeper services, Internet access, word processing, spreadsheets, and graphics. Digital phones can handle digital data. The next generation, of wireless services, is available now; these Internet devices will feature 400,000 bps speeds, with more to come. Many of the long-distance companies have adopted and are implementing a data networking approach, now being called an IP standard from the UNIX TCP/IP protocol suite. Data, voice, and video are being sent digitally as packets of data, rather than as parts of an analog frequency. The digital approach promises faster, cheaper and better telecommunications services; it is especially well suited to the fiber-optic wiring. But it is the widespread acceptance of digital players, e.g., digital TV, digital phones, CD and DVD video and music players, not to mention PCs, which suggests that digital data networks make the most sense. And in the long-distance arena, with the amount of data surpassing the amount of voice, moving both voice and data to IP networking, as AT&T is, reduces complexity and duplication. Cable-TV transmissions employ frequency division multiplexing to continuously send many channels one way to the TV tuners. Data and voice transmissions are two way, often short bursts from sender and receiver. This adds considerable complexity, as TCI and Time Warner discovered during the Implementation of phone and Internet services over their coaxial cables. Phone conversations are semi-permanent sessions between sender and receiver. The phone companies use circuit-switching technology to connect the two parties by establishing a circuit, or connection, for the duration of the call for the exclusive use of the two parties. But that is preceded by establishing the linkage or circuit through the local switching center, the long-distance carrier, and the other switching center. Here again the wire capacity is broken up into circuits using frequency division multiplexing. The traditional T-1 line provides twenty-four separate telephone circuits over copper wire; each circuit is equivalent to 64,000 bits per second digital channel. Data network standards were established as millions of local area networks were created in businesses all over the world. Data is sent and received in packets, called datagrams, defined by protocols, such as the dominant IP protocol. The packets have a "to" address, a "from" address, lots of digital data, and error-checking data; each packet also indicates that it is one of many in a group, to be assembled by the receiving computer. Data networks operate like the mail delivery system; data is put into the envelop, the to and from addresses contain both a single individual address as well as the area's zip code. Trucks (wires) take all the mail to central hubs, where it is again sorted and sent to further destinations and, eventually to the right zip code post office, which delivers the envelop to the right home address. Data networks use packet switching devices, typically routers, to truck the packets from router to router along the path. Packet switching is much more efficient for little e-mail messages or slow phone conversations. With packet switching, an exclusive circuit need not be maintained-the entire bandwidth is always open to accept packets. The standard for fiber optic transmission is 2.5 Gbps (2.5 billion bits per second), so very large documents or books can be moved in the blink of an eye. Compressed video and compressed music take up lots of bandwidth; a CD holds 600 million bytes (4.8 billion bits), but that can be compressed by half into roughly 2.5 billion bits, and could be send and received in a second. the rapidly increasing addition of transmission capacity and rapidly decreasing prices. Traditionally, the industry was dominated by AT&T, which built a highly reliable infrastructure to carry phone messages. Much of the telecom infrastructure throughout the world is optimized for voice, and is poorly situated for carrying data. At the current time, data make up 98 percent of the telecommunication content. Every major organization has built its own data networks, and the quantity of traffic continues to grow. These internal data networks are fast and inexpensive because they are digital. By contrast, internal data networks routinely transmit and receive data at ten million bits of data per second; phone modems, which permit data to be carried over the phone lines, are limited to 56,000 bits per second. Businesses can lease high-speed (1 million bits per second) data lines from telecommunication providers, but these lines are expensive. The fiber-optic technology described above promises huge advances in capacity resulting in potential decreases in transmission prices. The contrast between the speeds of the fiber cables compared to speeds experienced by most residential customers and many businesses using modems in untenable. Fiber-optic cables operate at billions of bits per second, and soon at trillions of bits per second. Local-area networks (LANs) linking PCs together operate at 10-100 million bits per second and higher, at very low costs. The slow speed of modems using phone wires is especially a problem as users attempt to download software or music, or even to access graphic-intensive Web sites. Remaining profitable as prices drop is a difficult process. The PC industry is the clearest precedent; major computer companies, e.g., IBM, NCR, and Digital Equipment, Hewlett-Packard, were often at a disadvantage against newer companies such as Dell and Gateway. Similarly, it will be difficult for large telecommunications companies, such as AT&T, to compete against newer competitors such as Quest and ITCX. The larger long-distance carriers have world-wide operations and the economic benefits of huge scope and scale; they need not depend upon any other company's services. But these large long-distance companies have enormous investments in a now-profitable, but rapidly obsoleting, infrastructure. AT&T, for example, is battered by operating cost and price structures that reflect the past limitations of transmission capacity, which, in turn, resulted from slow-speed media and switching devices. It is much cheaper to maintain a single strand of fiber-optic cable and its switches than thousands of copper cables and their switches, when both carry the same amount of digital data/voice/video. The large traditional companies will be squeezed by the need to make major new investments in the latest fiber-optic switching technologies, while at the same time covering the costs of operating the old infrastructure as the prices are dropping. Another problem for the established long-distance carriers is their requirement to pay access fees to the Regional Bell operating companies that complete their calls to customers. The rationale for the access fees is that the long-distance carriers need to contribute to the costs of providing universal service across the country, especially to the rural telephone companies, rather than have those costs shouldered only by local phone companies. The long-distance companies are saddled with $25 billion of subsidies to the local phone services. As AT&T broke up in 1984, the long-distance business was highly profitable; long-distance calls were billed at 50 cents per minute in 1984, with access fees at 15 cents per minute; now the average long distance charge is below 10 cents per minute, but the access fees remain high-above three cents per minute. Despite growing pressures from businesses and residential customers, access to the Internet continues to be largely funneled through telephone modems, devices which translate digital computer data into analog signals that are then carried over phone lines. The local telephone companies appear highly resistant to upgrading their technologies and wiring. They are trying to introduce high-speed 1.5 million bits per second (inbound only) Internet access using new modem technologies, but appear to be having problems rolling out these Internet services to residential customers. Cable-TV companies provide Internet access via cable modems in the major metropolitan areas. The phone companies offer high-speed Internet access via DSL modems, but only a very limited number of homes have been wired with DSL. The cable-TV providers and the local telephone services continue to be protected by the FCC from the competitive pressures assailing the long-distance companies; they have been protected from the need to deploy digital technology in order to remain competitive. By contrast, newer wireless cellular phone companies require a relatively small investment for a regional phone system, serving a city and suburbs, for example. But many wireless phone customers abhor the roaming charges, which are costly because the regional wireless company has to subcontract with a long-distance carrier for calls outside its region. The telecommunications industry is experiencing a whirlwind of activity. Rapid growth is occurring in every sector of the industry, but data networks to accommodate Internet traffic are growing as fast as companies can implement them. The industry competes globally, and having global reach appears to be a competitive edge. Bigger is indeed better if the goal is to connect businesses in the United States to their sub-sidiaries in other regions of the globe. At the same time, the ability to deploy technology that is smaller, faster, and cheaper gives advantage to smaller, more agile companies. Smaller is better if, and only if, government regulations permit smaller companies to take chunks of the more lucrative business segments from the established companies. In the short term, the best telecommunications segment is the cable television business. Protected by municipal regulations, the cable companies have been able to raise prices for the traditional TV fare. But it turns out that broadband cable technology is the best way to provide a wide variety of services into millions of homes: TV, pay-per-view video, Internet access, e-mail, telephone, and digital tunes. The major cable companies could be sending millions of home bills for over $100 per month for such packages. In the short term, the regional phone companies are in the worst strategic position. The barrier to entry to compete against the cable companies is the steep cost of rewiring millions of homes and businesses and replacing their circuit switching systems. The traditional technology is obsolete and neither ISDN nor DSL can make telephone companies competitive against cable companies. In the short term the wireless phone business will continue to grow and prosper. It is safe to predict continuing growth for the foreseeable future. The speculation that virtually every adult in the United States will own a wireless phone surprises very few people; virtually every adult in Singapore and Hong Kong already does. Here again, having a global or national network is a powerful competitive advantage to a wireless phone company; Sprint and AT&T are both trying to grab market share by advertising low prices for calls anywhere in the United States. Calls are handled by one carrier from end to end, resulting in less complexity, less cost, and better service. New digital phones already offer caller ID and voice mail; and by adding computing power these devices are also offering e-mail and access to business databases via the Internet. Sending and receiving wireless data is relatively easy in a digital environment. "Distance is dead," claims Tom Peters in his book The Circle of Innovation, and that will be the single most important factor shaping the economy for the next 50 years. In the short term, demand for long-distance carriers will continue to grow at the same time that the capacity of every fiber strand is more than doubling every year. The Internet growth driving demand for backbone capacity is particularly high. Laser pulses transmit data along the hair-thin glass fibers. Each strand of fiber-optic cable can now move data at a very high speed. Voice and data traffic on the North American long-distance backbone now approximates 1 terabit-each strand of new fiber-optic cable may be able to carry that much. Cables often contain ninety-six strands of fiber, but some have as many as 436 strands. Capacity should catch up with demand within the first decade of the twenty-first century. Indeed there should be a glut of capacity. And that means continually declining prices. The trick in this business segment will be to offer very low prices and have very low costs. Douskalis, Bill. IP Telephony: The Integration of Robust VoIP Services. Upper Saddle River, NJ: Prentice-Hall PTR, 2000. Freeman, Roger L. Fundamentals of Telecommunications. 2nd ed. New York: John Wiley & Sons, 2005. Schoning, Heinrich. Business Management of Telecommunications. Englewood Cliffs, NJ: Prentice-Hall, 2005.